March Madness has just begun: sunny beach days, loud music, posh brunch spots, late nights involving lots of alcohol, followed by binge eating Papa Johns... Let me tell you, nothing says you've had a successful night more than stuffing your face at the end of the night with greasy, cheesy, pizza, but real talk- I'll die if I eat all that processed garbage.. So I made this instead :) And I swear to Gawdddd you're gonna love this just as much. 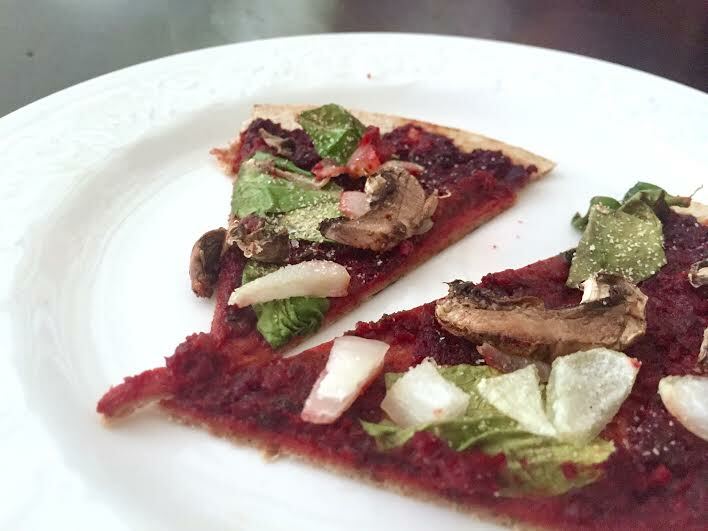 Crust: I improvised and used a flax flat bread from Whole Foods but I'll have a recipe for that soon. Cook onion and garlic in pan with olive oil until slightly brown. Add the rest of ingredients (roasted beet, tomato, sun-dried tomatoes, etc) to pan so they can absorb the flavors of the garlic and onion. Cook for 5 minutes and pour ingredients into food processor and pulse until completely blended. Assemble ingredients and pop in the oven at 350 degrees until the edge of the bread is crusty and your kitchen smells like heaven. (20 minutes ish) Then stuff your face :) Enjoy!